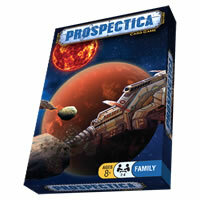 Prospectica is an out-of-this-world card game where strategy and luck play an important part of winning. Players will be on the hunt for asteroids where they can then mine the materials inside them and sell them for the best price they can. You'll be customizing your starship to best take on the upcoming challenges. Do you have what it takes to outwit your opponents? Coming in at around 30-45 minutes to complete the game, this card game will take some time to build up to the 4000 point goal. You will, however, be on the edge of your seat the whole game as you attempt to become the Prospectica champion. A great game to know how to play and share with your friends. Grab your copy today. Review Completed (2017-07-19) Three, two, one, blastoff, Prospectica! 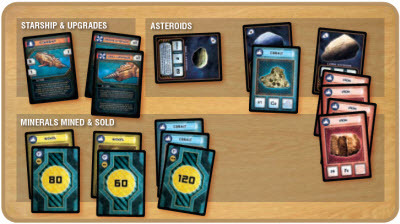 Float out in space with the card game Prospectica. We’ll say right out of the gate – you’ll need to read the instructions a few times to get this game down unless you are familiar with games of this nature. That said, once you understand the game and all its dos and don’ts, you’ll love this game. Prospectica comes in your average double deck tuck box with two stacks of cards totaling 108 cards. Quality is good and graphics are well done throughout. Visual cues on the cards help you know the key attributes for each card although some cards will need to be read to better understand its function. The rules are clear and explain the game fairly well. After one time playing they’ll make a lot more sense. We enjoyed the amount of options there are in this card game (although that’s what got in our way our first time through). There is definitely a lot going on as you can play upgrade cards for your spaceship, seed an asteroid, mine an asteroid, utilize the face up discard pile or hide your discarded cards strategically and even try to maximize your purchases. A little luck is involved (as with any card game) but the strategy built into the game can help get you back in the lead if used correctly. Due to the multiple hands needed to win the game, just because you have a bad string of luck on one hand doesn’t mean you can’t recover from it in any subsequent hands. Regardless if you’re a space geek or not, this is a fun card game that will get your brain thinking. It is a bit more involved than just having one goal or one advantage to the game. You'll need to best use your spaceship and its upgrades, seed the right asteroids and get the most money for your minerals. It's a race to gain 4000 points. If you can get there first you'll win. Your game will come with 108 playing cards and the official Prospectica game rules and instructions. Please keep in mind that the official Prospectica dice-card rules and instructions could be different depending on the game version you have. The rules below are some of the exact directions on how to play Prospectica. Share with us your comments, funny stories, tips, advice, strategies, creative ways to play, questions about how to play, problems with the rules or anything you want about Prospectica. All submissions will be reviewed within 24 hours. Click here to add your Prospectica comments.